Scalp stands guardian over the gateway to the wonderful Inishowen peninsula and provides a grand viewing platform for modest effort. This dander follows the access road to the two sets of communication masts atop the 1.5 mile back of the hill. This starts at 396249 B and there is limited parking at a layby a little further along outside a couple of houses. The access road passes a house and has a gate with a large 'closed ' sign on it. This had me slighty worried but a chat with the owner put me at ease. The access road is privately owned and was built by the family to the first masts (operated by Vodafone) and later extended to the top of the hill itself after access was negotiated from the forestry commission. The family then built the masts here themselves to rent out. The road itself was opened for paying traffic for a number of summers but this has ceased due to concerns over insurance. Ther is no real issue with walker access but obviously pays to seek permission of the landowner to use the road to the top! The concrete road is initially brutally straight uphill, burning leg muscles, before it gains height more gradually through a number of hairpin bends. 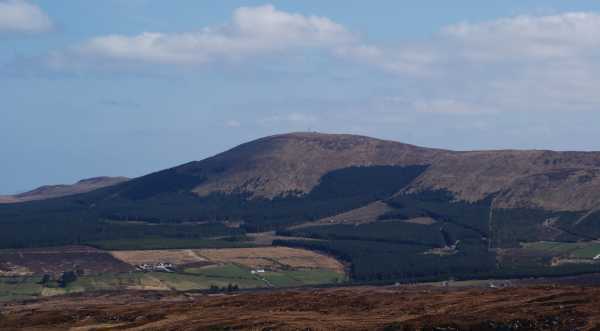 Views over Lough Foyle, Derry City and the Sperrins accompany the walk and this is extended to Lough Swilly and the hills of Inishowen as the lower end of the hill is reached. A walk along the top on the road is relatively easy and offers fantastic views - even on a day with cloud. There are a few large stone seats at good viewing points (from the small quarries used for the road on the way up no doubt) and probably hark back to when the hill was open for business! Top reached in 2.78 miles and 55 minutes - more masts and a newly installed wind turbine which was turning furiously in the strong breeze. An isolated telegraph pole marks the top and has a number of waymarkers - Muckish 30miles, Errigal 35 miles, Paps of Jura 80miles and Ben More 120 miles. Today at times i could barely make out the pole as mist swept in but the owner informs me that the Scottish coast is certainly within range of the eye. The trig pillar is located a little way off and reached by a path. This looks out over Derry, Lough Foyle and the Foyle river as it snakes away south - also gives a good perspective on the small hills surrounding the city. A crudely fashioned wooden cross also looks over the city and a number of inscribed pieces of stone are lain at the pillar.